ARMORED SAINT guitarist Phil Sandoval (pictured) will sit out the band’s festival appearances in Germany next week so that he can stay home and be with his girlfriend while they expect their first child. The group states: “We have enlisted the help of guitarist Matt Price from BEHOLD! THE MONOLITH to step up and fill in for Phil for these three festivals in Germany. “Phil will miss seeing all of you this time but he promises to ‘deliver’ once he returns for the dates we have booked in the fall. 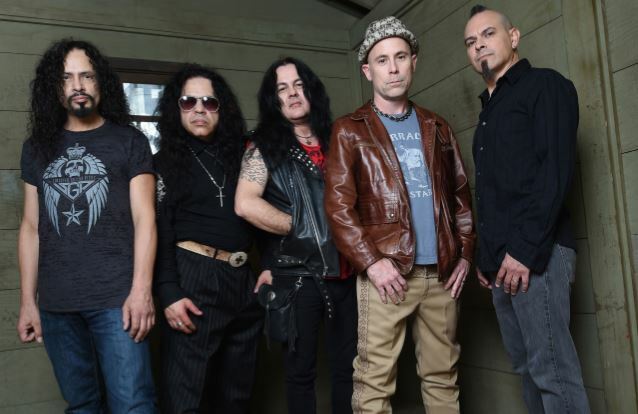 ARMORED SAINT will join forces with progressive metal veterans QUEENSRŸCHE for a U.S. tour in the fall. The month-long trek will kick off on November 15 in Seattle, Washington and conclude on December 15 in Colorado Springs, Colorado. Also appearing on the bill will be MIDNIGHT ETERNAL. ARMORED SAINT‘s seventh studio album, “Win Hands Down”, was released in June 2015 in North America via Metal Blade.